For a limited time, you can get free stuff just for using Android Pay. 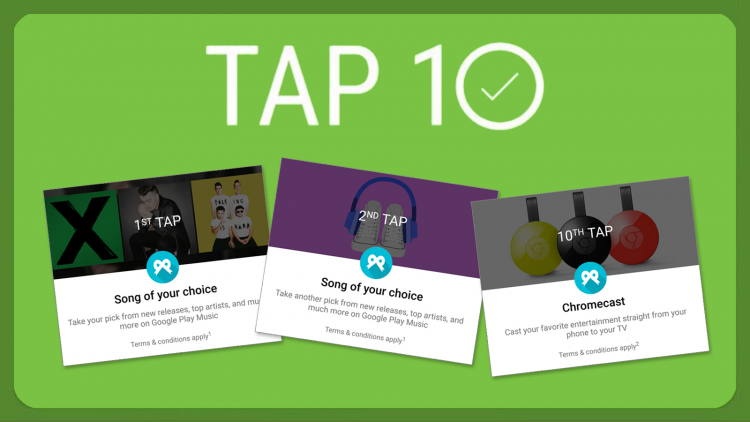 Tap-to-pay ten times this month and you’ll score a free Chromecast so you can stream videos straight to your TV. Google’s Chromecast is an amazing device that lets you stream videos from YouTube, Netflix, and more straight from your phone to your TV. And now, thanks to an awesome promotion in the Android Pay app, you’ve got a chance to get a free Chromecast of your own. The promotion, called “Tap 10,” is designed to get you to use Android Pay to make more purchases. The more you tap and pay for things, the more you earn. For your first few purchases, you’ll get yourself free songs, movies, and subscriptions on Google Play. Make ten purchases by February 29th, 2016, you’ll score the free Chromecast. Of course there are some rules you’ll want to be aware of. For example, you’ve got to wait at least five minutes between purchases, and you can’t repeat the cycle. See here for the complete Tap 10 terms so you know what you’re getting into. If getting a free Chromecast sounds good to you, all you’ve got to do is fire up the Android Pay app on your Android device and head to the “Offers” screen. Good luck, and enjoy your free Chromecast! Designed exclusively for mobile users, QuickThoughts exists solely as an app. iOS and Android users can now earn rewards for taking mobile surveys and mystery shopping. See more articles about apps that pay.